It would look a phrase with a link to tweet with just a click thanks to Click to tweet, a simple service that lets you generate links that will make the classic role of Tweet button, present on most websites, but unlike the latter does not address the article title but a specific phrase within your content. The best thing is that it can mask a tweet so that when clicking on the link is automatically accompanied by other URLs, mentions and hashtags. To use it simply enter the website Click to tweet, fill the box with the message we want to be retweeted (and optionally including attachments sentence above) and then click on Generate Link! 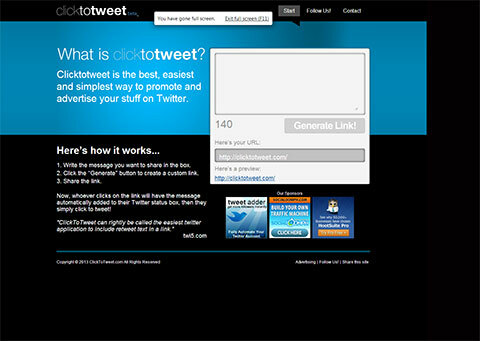 to generate the URL (with a http://clicktotweet.com/xxxxx type structure) that will serve Tweet button. The rest is a matter of personal ingenuity, for example, to put in a striking way the link and the word that invokes it. In the example I wrote ‘click to tweet this” but, as it is a simple link, there are no limits: “share phrase on Twitter”,”tweet this sentence”, “sharing proverb”, “sharing philosophy”, “boasts with this phrase on Twitter”, etc.